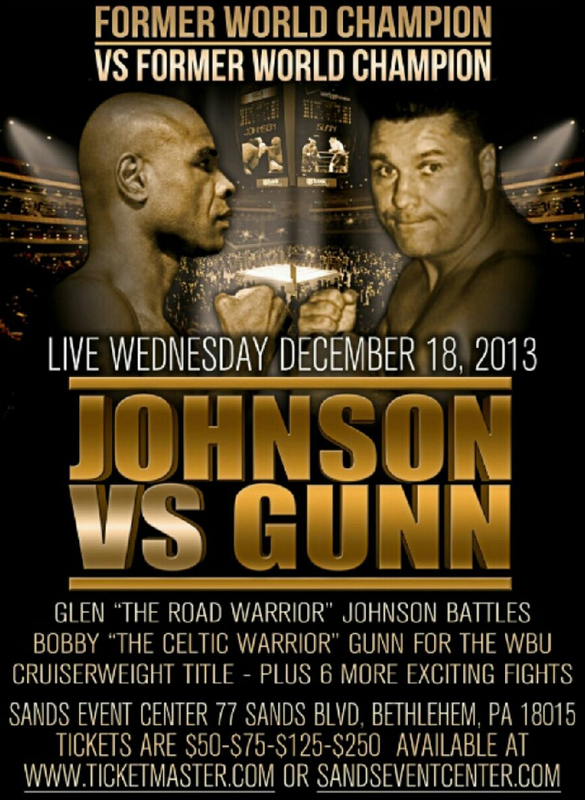 Bethlehem, PA (December 19, 2013) – Former WBC-USNBC, WBA-NABA and IBA cruiserweight titlist Bobby “The Celtic Warrior” Gunn believed yesterday’s match up with boxing great Glen “The Road Warrior” Johnson would serve as a perfect ending to a career that started four decades ago. Gunn, a bare knuckle boxing legend who is well known for his toughness, previously came up short in big fights versus Enzo Maccarinelli, Tomasz Adamek and James Toney. Against Johnson, “The Celtic Warrior” planned to box with speed, stay on his toes and move his head. Unfortunately, he was never able to get on track, taking a number of good shots from the aggressive and busier Johnson. As the rounds progressed, Johnson’s pressure bothered Gunn, who suffered a cut on his nose and showed a solid chin but was never able to match Johnson’s punch output. All three judges scored the eight round cruiserweight bout 80-72 in favor of Johnson, who improved to 53-18-2 with 36 knockouts. Moments after the decision was announced, the classy Gunn took the microphone to congratulate his opponent on a well-earned victory and inform his fans that this was the last time they’d see him inside the squared circle. “Some nights you just don’t have it,” stated the dejected Gunn. “I (got too caught up) in trying to land one punch but Glen isn’t the type of fighter that you can get out of there easily. Had I fought Roy Jones, I think I could have stopped him but I just couldn’t get my punches off. Gunn, who had a good training camp and didn’t have any major injuries, gave credit where it was due and didn’t search for excuses regarding his performance. Gunn, who was self managed and negotiated a number of big fights during his career, also plans to assist other young fighters and ensure they are not taken advantage of from a business standpoint. Since turning pro in 1989, Gunn fought in Mexico, England, Arizona, New Jersey, Mexico, North Carolina, Tennessee, Wisconsin, Virginia, Mississippi, Arizona and Pennsylvania. He competed in nine title fights, multiple controversial bouts, had more than 250 amateur matches and served as a sparring partner during his younger years for more than 25 world champions. His final professional record is 21-6-1 with 18 knockouts. Fans can interact with Bobby on Twitter :@real_bobby_gunn.